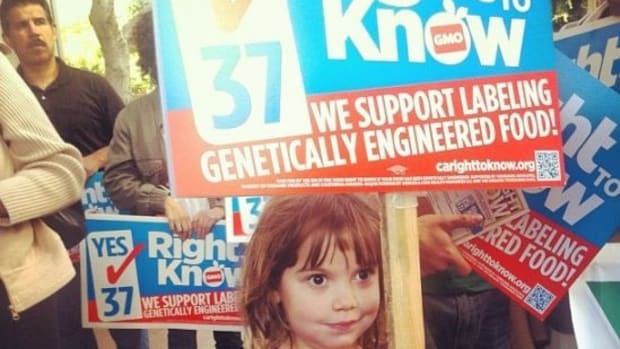 The battle continues in California over Prop 37, the Right to Know / Label Genetically Engineered Food Act. 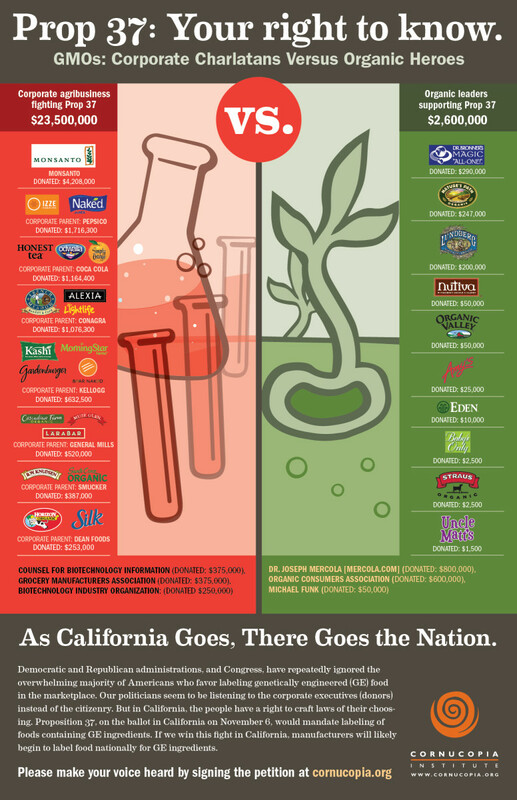 The California Secretary of State&apos;s office recently released proposition funding information, revealing which major food, agriculture and biotech companies are putting up big money to defeat the bill that would require labeling of food containing genetically modified ingredients. 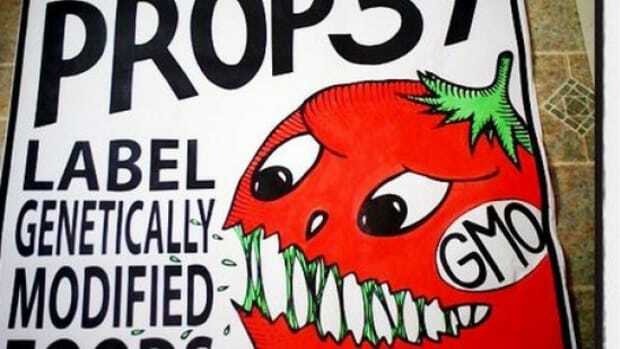 Unsurprisingly, three of the biggest contributors to the efforts to defeat the bill were the country&apos;s biggest GMO producers: Monsanto, Dow, and DuPont. 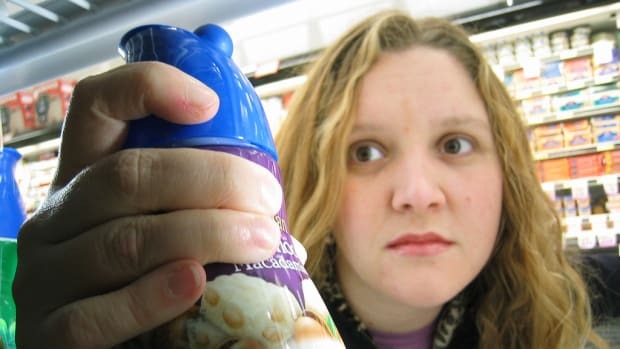 The Grocery Manufacturer&apos;s Association has also been a huge opponent of the proposition, and its president was quoted as saying that defeating Prop 37 is "the single highest priority for GMA this year." 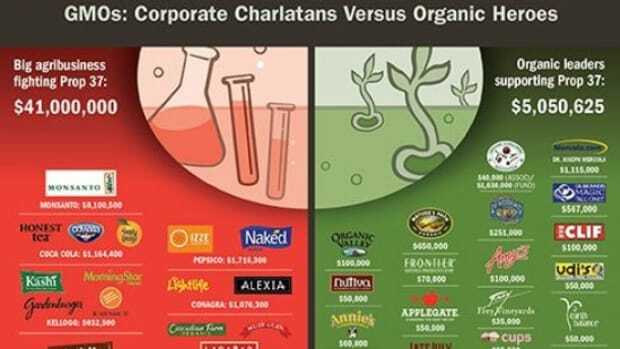 Staples of the natural foods aisles including Kashi, Cascadian Farms, Silk, Horizon Organic, Naked Juice and others, can be directly linked to oppossing the bill through their big-ag supporting parent companies making major donations to help get it defeated in November. The Cornucopia Institute recently called out Kelloggs, makers of Kashi cereal for not disclosing GMO ingredients in its "natural" cereals. 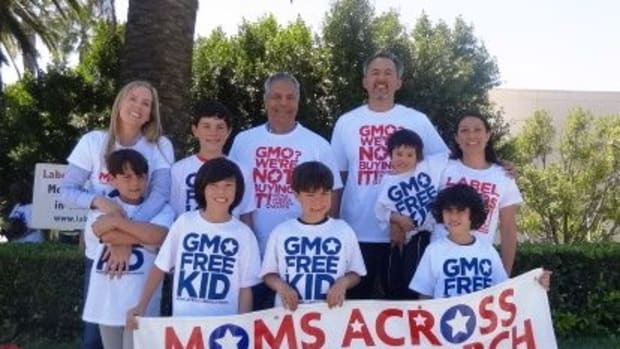 And although Silk milk-alternative products display the “Non-GMO Project Verified” seal and Horizon Organics brand claims to be opposed to GMOs, their parent company, Dean Foods, has contributed nearly a quarter of a million dollars to defeat Prop 37. In today&apos;s world of huge food conglomerates that might own many brands spanning the continuum from organic and all-natural to conventional, the intentions of the smaller natural brands can get lost amidst the policies that will benefit the company at large. 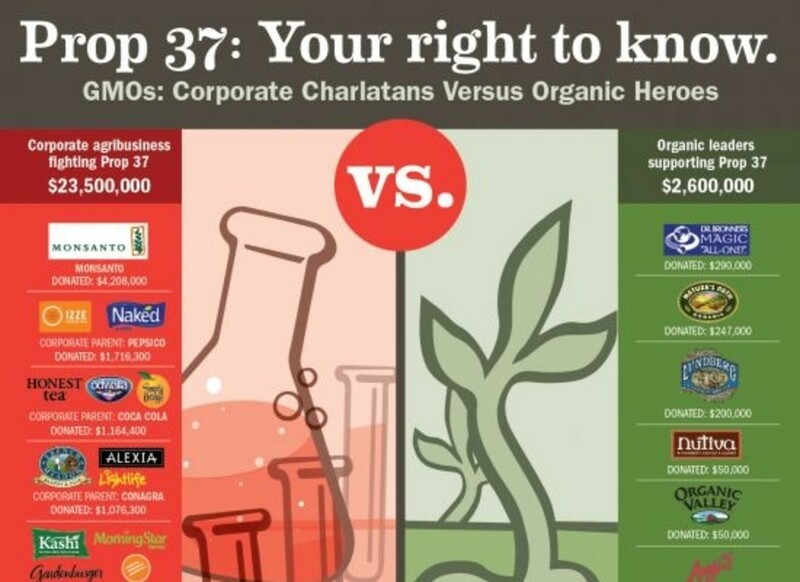 The infographic above also calls out an array of organic and natural products brands which have contributed funds to support Prop 37 including Nature&apos;s Path, Dr. Bronner&apos;s Magic Soap and Nutiva. But the numbers are no measure to the donations made by companies like Monsanto ($4.2 million). 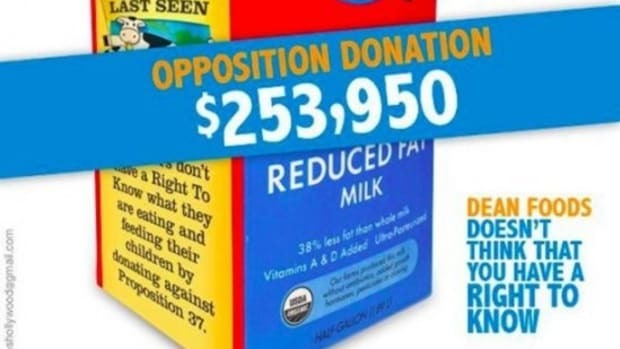 The opposition of the bill is outspending Prop 37 supporters by atleast 10 to 1, positioning the bill as a "costly food labeling" measure that they claim would cost California taxpayers millions. It&apos;s the same tactic they used successfully in Oregon in 2005. 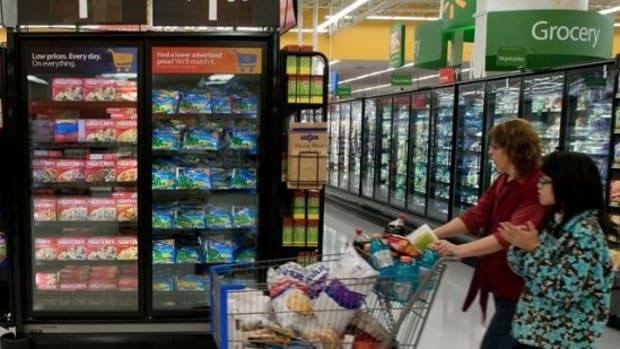 And while the organic brands can hardly compete financially with the multi-national behemoths like Coca-Cola and Kelloggs, polls consistently show an overwhelming majority of Americans want to know what&apos;s in their food. The United States is the only industrialized country without national policies or restrictions on genetically engineered food.